Jenna, Caleb and Ari unlock a time traveling map in this adventure. They find the map and journal that belongs to Jenna and Caleb's uncle. Of course they can't resist trying it out and travel back in time to the last ice age and the Missoula floods. Ari has unending knowledge about this time period and the animals that inhabit it. They get to see lots of extinct animals, the great ice dam and the flood that happens when the dam breaks. Once they get home they are scolded by their uncle, who is secretly pleased they have joined him on his adventures. I liked the history aspect of this graphic novel. I think the adventure will draw in readers and they will learn something in the reading. I wish the characters were a bit more developed though. Ari is just there to info dump every time they see something new. Jenna's job appears to be summoning the Thunderbird for rides and Caleb just seems to be the calm one. Maybe there is more development in the subsequent books? No matter how bland the characters were, the adventure was fun and educational. I certainly learned something! A really good educational graphic novel, with time travel! The art is really beautiful as well. This was particularly interesting, since I live in the area this ice age flood happened! I started reading Bretz's Flood after finishing. 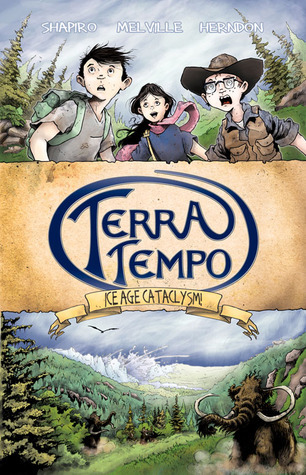 Graphic NovelInformationalElements of historical fictionTerra Tempo is interesting graphic novel for 3rd to 4th graders interested in the Ice Age. This book is packed full of facts about climate change, prehistoric life and geological processes. The pictures are brightly colored and detailed. I think some students would really enjoy this book. A mixture of non-fiction, time travel, and graphic novel. Nice to have a graphic novel that offers science information for children. Good information, but not much going on in the way of a plot. A trio of friends take a trip back in time to the Ice Age and experience ice explosion, waterfalls, and whirlpools firsthand. By book's end, their uncle has discovered the time trek and readers are clued in to the aunt and uncle's involvement in a secret society with a mission as well as the possibility that the children will serve as some sort of rangers in future books.Full color artwork is big on action and keeps the story moving along at an adventurous pace. I was disappointed by the lack of tension in this first volume because there wasn't exactly a bad guy and the scrapes weren't near enough to actual danger for me to be on the edge of my seat worrying that all wouldn't end happily.This is a series Magic Treehouse fans will appreciate as they grow. Additionally, the history and geology covered is great for classroom use and science enthusiasts. Recommended for 3-5+. A quick and easy educational graphic novel that reminds me of the Magic School Bus series but would probably remind kids of the Magic Tree House series instead. The info dump provided by their pal Ari was a bit over the top but it was interesting and it would be fun to soar over the glaciers, mammoth spotting. I didn't like the journal font, however. What I don't understand is why they included the mythic Thunderbird as the main mode of transportation. Yes, it would provide for a beautiful view, but isn't it indeed mythical? So it's not just science fiction with the whole time travel bit, but fantasy as well... Nice drawing style but rather boring characters that didn't really come across with many personality traits. Unfortunately, my namesake's skill is the ability to poke a Google map and follow the blinking lights, which updates to their current position. Really? She can't even navigate a regular old map?But I could see MTH kids enjoying this. Good travel adventure graphic novel for children (and adults). The three children find some secret documents in their uncle's desk, along with a detailed area map and a strange compass. They subsequently travel thru time to visit several of the geological eras in the Pacific Northwest (mainly the Portland Oregon area). You'll learn how some of the land was shaped in that area. I found it interesting, having grown up in the Midwest and knowing about the glaciers there. I didn't know about them here, so I learned something too.Easy read, some large words, but all is easily understandable. I was attracted to this book for the local history aspect, and am always on the lookout for interesting reading materials for my 11 year old. This was not interesting, as it was a dump of information coming out of kids' mouths. The artist's drawing skills really stand out in the landscapes and architecture, but the faces often come across as misshapen or melty, which is a bit of a turn off as well. This is a GREAT series for kids and for nerdy, natural science-inclined adults. My 14-year-old son and I both really liked reading the first two volumes and can't wait to get the rest of the story. Very nice! I thought about tagging this as nonfiction, since it contains a lot of geological fact, but that fact is framed by a time-travel story, so maybe not.My NFNT review is here. This would be a great book for a grade school classroom. Lots of information about the Pacific Northwest during the last Ice Age, presented in an entertaining format. Meh. I can definitely think of kids who will like it - but the story didn't mesh well with the nonfiction aspects of it for me. Eh- not so great. I will see if the kids want to read it- 4-5th for sure. Did not like the science stuff thown in as an after thought! DavidShapiro Erica Melville Christopher Herndon - David received his BA in natural history and creative writing from Prescott College. He has worked as an interpretive guide for the US Forest Service, as an animal tracker for a non-profit conservation organization, and as a content writer/camp director for large scale, multi-day art and music festivals. He lives in Portland, Oregon, where he is the president of Craigmore Creations, a publishing house that specializes in natural history entertainment. He is the author of several books, including Blunderbuss Wanderlust, the Terra Tempo series, and the web comic Around the World with Haley Zoic. He is available for author talks, naturalist presentations, and nature themed writers workshops.